This year on August 12 Armenians will celebrate one of the 5 main holidays of the Armenian Church – the Feast of the Assumption of the Holy Mother of God. On this day Armenians celebrate the bodily taking-up of the Virgin into Heaven. According to the Sacred Legend, before his Ascension Jesus Christ promised his Mother to take her to the Heaven when her life on Earth comes to an end. After the Crucifixion, Mary lived with prayers for about 12 years under the care of John the Evangelist. She often visited the Empty Tomb of Jesus Christ and prayed. Twelve years later during her visits to Golgotha Archangel Gabriel visits her and informs her that her life on earth will soon come to an end and she will be taken to the Heavenly Jerusalem. Mary tells about it all her friends and servitors and asks John to provide a Liturgy, so that she can have the last Sacrament. Then she lay in her room waiting for the hour to come, and Apostles surrounded the Holy Mother of God. Soon a very bright light shined and everyone was startled to see Jesus Christ in the room accompanied by angels. Seeing her son, Mary rose from her lying place, bowed to the Lord and consigned her soul to her son. Before her death Mary had asked to bury her in the Dean of Gethsemane. She was buried there in a cave and the entrance of the cave was closed with a huge stone. For three days the Apostles did not leave the tomb and were constantly praying. During the last days of Mary’s life on earth all the Apostles were with her except for Apostle Bartholomew, who arrived only after the funeral and did not manage to see her for the last time. The Apostles saw him weeping and decided to open the entrance of the cave so that he could make his farewell with the Holy Mother of God. When the cave was opened everyone was surprised to see that her body was no longer there. It was Bartholomew’s mission to discover the Assumption of the Holy Mother of God. According to the legend Mary died on Thursday, but the Armenian Church celebrates her Assumption, which took place three days ago – on Sunday. It is also a common practice in Armenia to congratulate all the girls and women with the name “Mary” (“Mariam” in Armenian) on that day. On this day after the Liturgy the Church holds the grape-blessing ceremony, which “officially” opens the season of grape. Most of the Armenians refuse to taste grape before it is “blessed.” In the Old Testament the first harvest of the year was taken to the Church and was presented to God. Among them were wheat, grape, fig, pomegranate, olive and so on. 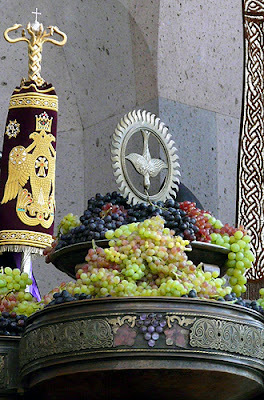 The Armenian Apostolic Church chose grape as a symbol of the harvest. During the ceremony they read the prayer of St. Nerses the Gracious, which says that God created the nature, the plants and the fruit trees, then He created Adam and Eve. This day is the blessing day for the whole harvest that God presented us with. During the ceremony people ask God for fertility and for a favorable year for harvest growing.